PHOTOGRAPHERS ARE FREQUENTLY ASKED to define a “bad” picture, or, more specifically, the worst picture they themselves ever shot. The question is a bit of a logic trap, though, since it typically tricks us into naming something that failed because the subject was moribund, or because we mis-read the light, the aperture, the composition. The trap further reasons that, if you have checked off all those boxes, you should end up with a great picture. But all of that is bug wash. What makes a picture bad is when you were not ready to take it….. but you took it anyway. Sometimes the problem is ignorance: you simply aren’t old or wise enough to know what to do with the subject. Other times, you have substantial barriers between you and an effective story, but you try to drill past what you can’t fix. And, you can no doubt add your own list of things that, ahead of the shutter click, should scream, “not now”. Try to make the picture before either the conditions or you (usually you) are right, and you lose. Just as I lost, in great big neon letters, with the mess you at above left. 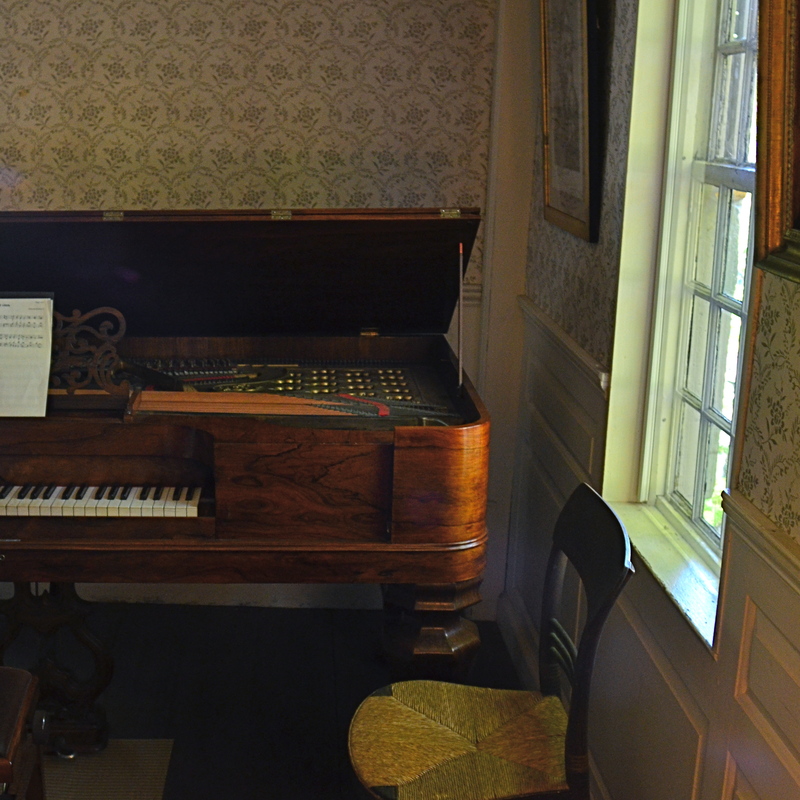 In 2016, I visited the Old Manse in Concord, Massachusetts, a venerable colonial-era home which sits right next to the small footbridge that served as the site of the first major battle of the Revolutionary War. What excited me most, however, was that it had served as a temporary home for the young Ralph Waldo Emerson, and that he had written Nature, the first of his great works, while living there. 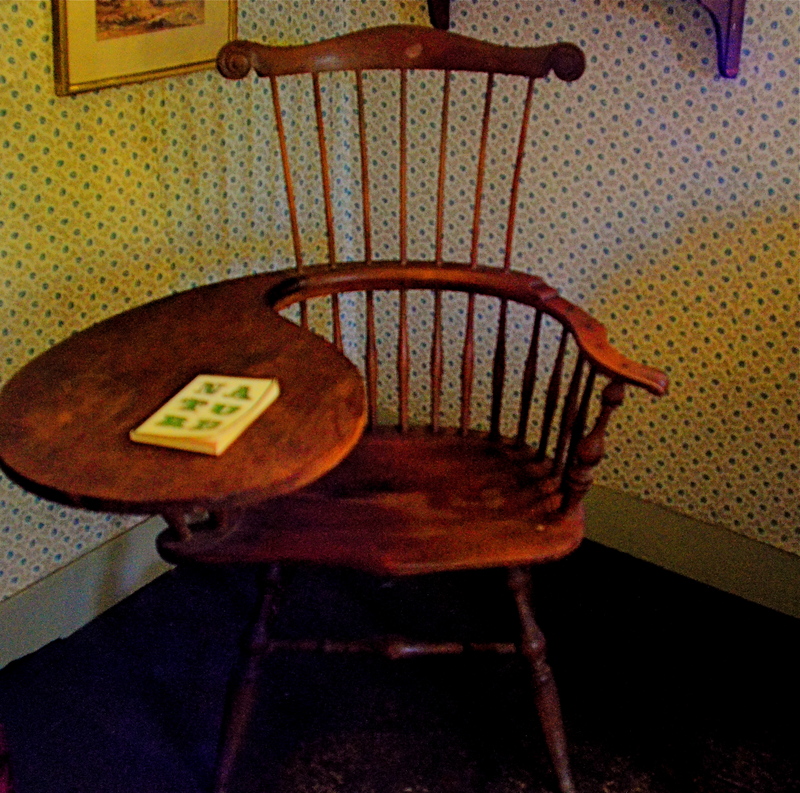 And to really put the cherry on the sundae, the house still contains the small writing desk he used to do it. The house is lit only with indirect window light during the day, but with a fast prime lens and a decent eye, there’s more than enough soft illumination to work with to produce decent results (see left). In fact, just before my tour was to head into the room containing the desk, I had already harvested quite a few usable shots…so many, in fact, that I was getting teased by the others in the group…the usual “oh, another picture?” stuff. Uncharacteristically, I began to worry about whether I was holding everyone else up, and thus started to hurry myself, to shoot not as I intended, but in deference to what I thought others would like. By the time I got to Emerson’s chair, the light, my lens, even my own experience were all useless to me….because I wasn’t ready to shoot….but did anyway. And so you behold the unholy mess that resulted: lousy contrast, uneven exposure, muddy texture (is the chair made out of wood or Play-Doh? ), tons of noise, indifferent angle, and, oh yeah, garbage focus. Worse yet, the psyche I’d put upon myself was so severe that I didn’t slow down for a more considered re-do. No, I rejoined the group like a polite little camper, and left without what I had come for. And that is all on me, and thus an important entry in The Normal Eye, an ongoing chronicle which is designed to emphasize personal choice and responsibility in photography, versus just hoping well-designed machines will compensate for our lack of concept or intention. This is not easy. This is ha It’s no fun realizing that what went wrong with an image was us. But it’s a valuable thing to own. And to act upon. This entry was posted on January 27, 2018 by Michael Perkins. It was filed under Available Light, Conception, History, Memorials and was tagged with Landmarks, Natural Light.